The Varley-McKay Art Foundation of Markham presents Vintages at the Varley: New World Wines. This event takes place at the Varley Art Gallery on Wednesday, April 17, 2019 from 6:30 – 9:00 pm. A selection of 16 wines from Canada, the United States and South America will be featured. To complement the wine selections, we will also have a delicious variety of food on offer in our cold buffet. 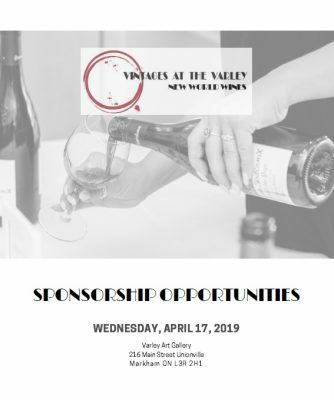 Supporting Vintages of the Varley: New World Wines provides you with a unique opportunity to engage with the local community, to help build your brand profile, and to demonstrate your commitment to the cultural community and the arts. 57% of the population aged 15 and over had completed some form of Post-secondary education.